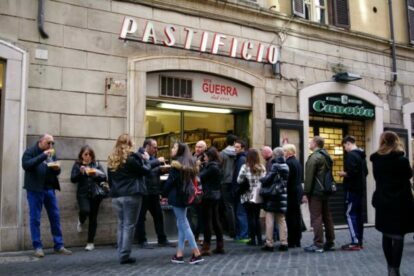 Tourist traps are a plague that have been affecting Rome I dare say since the day it was founded. Though I do not know of any proof, I can safely say that even in ancient Rome time fake pizza places and bad “traditional” restaurants were everywhere, or at least I want to believe that’s true. So whenever I find a good, true place near a tourist attraction I make sure I sacrifice myself by going there as much as I can there so they will not go out of business. Not every hero wears a cape. Pastificio Guerra is exactly that. Right next to the Spanish Steps, for the ridiculous price of 4 euros you get a takeaway plate of handmade pasta, unlimited water, a fork and knife and if you ask nicely even a glass of wine. They change what pasta they offer daily but usually they serve gricia, an amatriciana without the tomato sauce, and pesto. And the pasta is simply good. And that is exactly what pasta should be. Side note: on December 24th they give out free pasta to everybody, so if you pass by on that day, keep an eye out for the huge line that will form outside. Free pasta is free pasta.